Choices, choices, choices. Did you consider all the candidates? Why didn’t you? Do you wish someone could outline what went wrong in your game? Is your endgame technique good enough to compete at that level on equal terms? One of the most enriching and enlightening activities a chess student can (and should!) 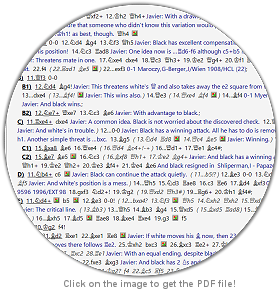 engage on is the annotation of his own games, either by himself (and then having those annotations corrected by a supervisor) or by having his own games annotated by a master. I’ve been annotating games for more than 20 years. I spend a fair bit of time on each game and my students are often quite surprised at the amount of ideas, variations and thoughts that I include in my annotations. How does each plan work? Questions answered Often a student will want specific answers to questions that he had during the game. All you need to do is add the questions to the pgn (or chessbase) file and then email it to me. You’re allowed a maximum of 10 questions per game. Some typical questions you could ask would be: What do you think about this opening? I wasn’t sure what to do here, what would you suggest? I thought I stood better in this position, was I right? I wasn’t sure about exchanging my Bishop for his Knight here, what do you think? Was this a strong move? Is this ending lost? Should I attack on the Kingside or the Queenside? Can black hold this position? Do you think my tactics are bad? What5 do you think are my main weaknesses? Etc. Remember, 10 specific questions. Game annotated by you, corrected by Master If you choose this plan, I’ll ask you to send me one of your games with your full notes. I’ll then proceed to correct (where necessary) those notes and variations and add my own comments and variations. This plan has the advantage of providing me with valuable feedback regarding your thinking process during the game and thus I’ll have a better picture of where you need to improve, weaknesses in your approach to the game, and other aspects such as preparation before the game and so on. Game annotated from scratch by master I’ll provide you with variations, comments, graphical annotations, opening review + suggestions, tactical corrections and suggestions, Strategic review and radar, practical advice and, if you wish, a voice message with my impressions of the game as well as some advice. 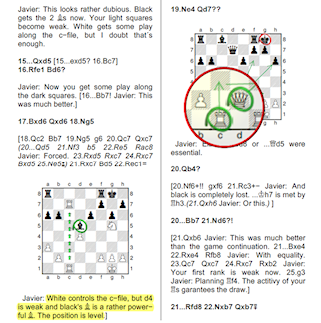 Annotation in Chess Informant style This is the most affordable alternative. 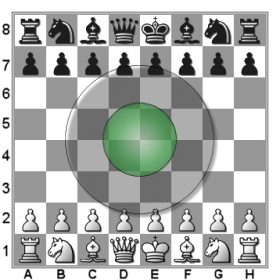 I’ll annotate the game in chess informant style: variations, chess symbols and graphical annotations. Until July 2016! Special offer: 10€ (or 10$) discount on all our annotation plans currently available ! For more information, please fill in our information request form, and we'll send you a .pdf file with all the details. Alartosev-Capablanca, Moscow 1935. A classic game where the Cuban GM seems to be doing very little. But small advantages tend to pile up and this game is no exception. Capablanca-Levenfish, Moscow 1935. Meran variation. What makes this game a little special is the accuracy of white's attack: not even a modern computer could have handled it better! Rubinstein-Hirschbein, Poland 1927. A wonderful attacking game by the "Uncrowned Champion", Akiba Rubinstein. Bb1, forcing the creation of a weakness on f6, followed by Ne4! are classy moves. chess.clinic provides professional chess coaching, assessment, and counselling services to people from all over the world. © Copyright 2015 chess.clinic. All Rights Reserved.